The IMPACT Act of 2014 mandated that nursing homes submit electronically staffing data based on payroll and other verifiable and auditable data using a uniform format. In the newly released “Medicare Program; Prospective Payment System and Consolidated Billing for Skilled Nursing Facilities (SNFs) for FY 2016, SNF Value-Based Purchasing Program, SNF Quality Reporting Program, and Staffing Data Collection; Final Rule,” CMS provides information on these new stringent requirements for SNFs, including the use of a Payroll-Based Journal. 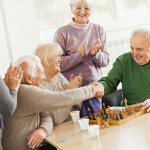 The newly proposed overhaul of nursing home regulations may change the way facilities need to look at their staffing by using a competency-based approach. In this webinar attendees will learn about how these new compliance requirements will impact them and gain an understanding of the information in the newly proposed regulatory overhaul of the nursing home regulations. Join CMS Compliance Group President Linda Elizaitis for this Long Term Living webinar on Thursday, September 17, 2015. View details and register now.